Is the Alliance for Workers' Liberty "Shachtmanite"? Daniel Bensaid: "We need to create a common culture"
Time to link up student activists! Afghanistan - Obama’s policy: really “realistic”? Editorial: Yes, fight for jobs — but for all workers! 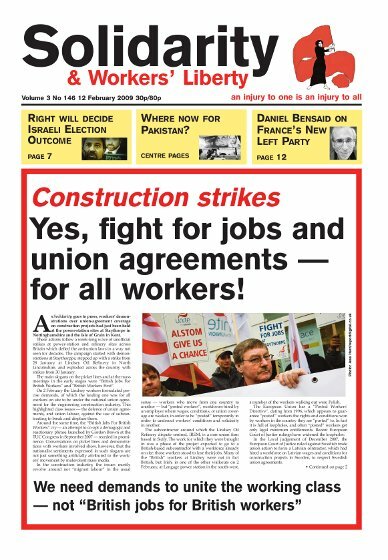 Construction strikes: Yes, fight for jobs and union agreements - for all workers! Sean Matgamna starts a series on misunderstandings, misrepresentations and lies about the Alliance for Workers’ Liberty, AWL. Yes and no. AWL started as a “Cannonite” organisation, that is, an organisation with politics in the broad spectrum of the post-Trotsky “orthodox” Trotskyists, the opposites to the “Shachtmanite”, “heterodox” strand of Trotskyism after 1940. Specifically AWL identified with the Cannonites in the 1953 split in the Fourth International between “Pabloites” and Cannonites. Two other comrades and I went to Hoo on the Isle of Grain on Saturday 7 February to talk to local workers and residents. We have visited the area before as socialist activists at the Climate Camp. We had some long conversations with a group of men who were all locals, but none of whom worked on the plant, although they had family members working at Kingsnorth. They knew very little about the strikes but wanted to talk about them, climate change, banks, protesters, capitalism in general. Liam Conway was on the construction workers’ demonstration at the Staythorpe power station site in Nottinghamshire on Wednesday 11 February. A debate from the website (in full here). 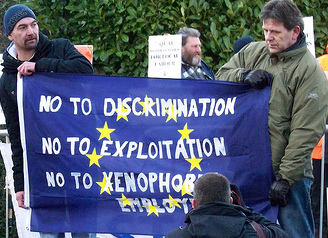 NHS privatisation, Arriva Trains Wales, London Underground ex-Metronet jobs, Tube cleaners, Irish unions and students. NHS PRIVATISATION: A massive transformation is taking place in primary care as the division is made between commissioning and providing services. By April 2009 Primary Care Trusts are expected to have formalised the separation between their providing and commissioning arms and plans are to be in place for the transformation of the providing body into an independent organisation. GUADELOUPE: The French Caribbean island of Guadeloupe has been rocked by a general strike — a total shut-down of shops, supermarkets, schools and public services. A demonstration on 24 January saw 25,000 workers take to the streets; an equivalent demonstration in Britain would comprise over 3,000,000 protestors. Daniel Bensaid, a leader of the LCR and now of the NPA, spoke to Vicki Morris and Ed Maltby. Over the weekend of 6-8 February, working-class activists in France took a big step towards the creation of a powerful revolutionary party. Their success is cause for rejoicing — and contains lessons for the British left. The preparations for the launching of a “New Anti-capitalist Party” (NPA, a temporary name which has now been made permanent), initiated by the Fourth International‘s French section, the Ligue Communiste Révolutionnaire, have been under way for more than a year. On 20 January, a laughably unrepresentative “extraordinary conference” of the National Union of Students passed its Blairite leaders’ plans to gut the union’s democracy. Under the new constitution, NUS will be far less responsive to rank-and-file initiative and attempts at control than before.